I�ve have had my �95 993 Carrera for 3 � yrs now and have slowly been adding relatively low cost modifications to improve the overall performance of the car. Engine re-map, Robin Sun�s RSR exhausts, PSS-9 suspension on monoball mounts set to RS height/alignment, 18� RS replica wheels, you know the sort of thing. 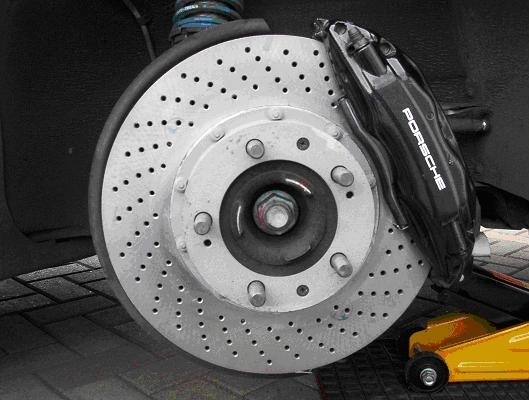 I heard about a brake modification that would allow me to use 993 TT/RS 322mm discs with my standard S4 calipers. This sounded like a very cost effective upgrade if you needed new discs anyway so I decided to do this when the time came. I posted a question on the 993 Forum of Rennlist which received generally favourable comments and was agreed as being a sensible low cost mod and so I resolved to go ahead. To cut a long story short I have adapted the S4 caliper to run TT/RS pads on the larger TT/RS disc. 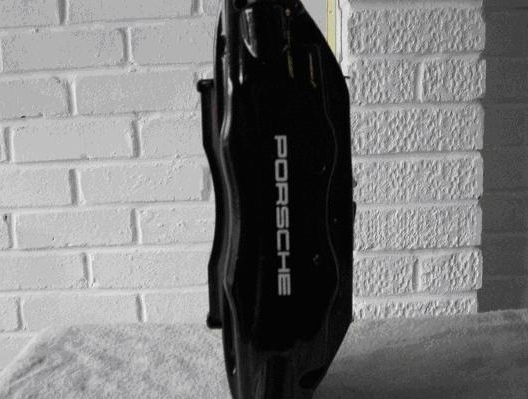 I have used all Porsche OE parts except for a specially fabricated aluminium spacer. The upside of this modification is a larger heat sink area for improved cooling and lower disc and pad temperature, for a minimal cost over straight replacement items. 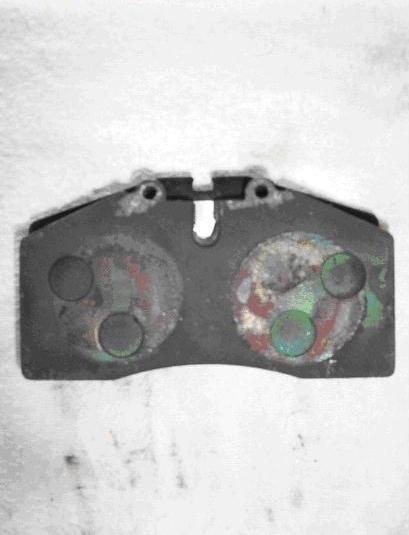 The downside is that the pistons do not operate directly on the centre of the brake pad due to it being held further into the caliper body (by 9mm). 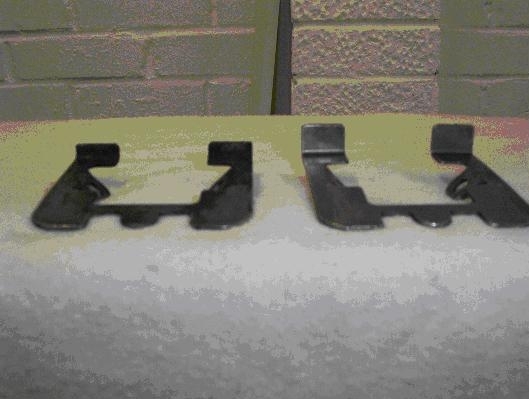 This may result in uneven or excessive wear to the outside of the pad, time and testing will tell. My thinking is that this is no worse than running the smaller S4 pad on the 322mm disc. 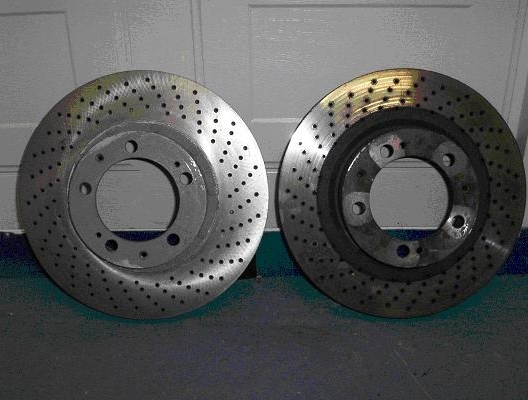 I acquired a set of the spacers required to space the caliper away from the hub so that the larger disc could be accommodated, along with a pair of used RS discs from someone who had been running this mod successfully. Seeing the used discs put some doubt in my mind�. the used disc was worn beyond it�s outer edge so that no lip was visible (see pic below) as should be the case with standard discs. New 322mm TT (bolted hat) disc left, and 322mm RS (cast hat) disc previously used with S4 caliper and spacer. Note the un-swept inner section (approx 9mm) of the used disc. Picture of spacers required to fit (sandwich) between the hub mounting and brake caliper. Because of the spacer, longer bolts were required to fix the caliper to the hub through the spacer. The original S4 bolts are 72mm long and therefore an 82mm bolt should be used. 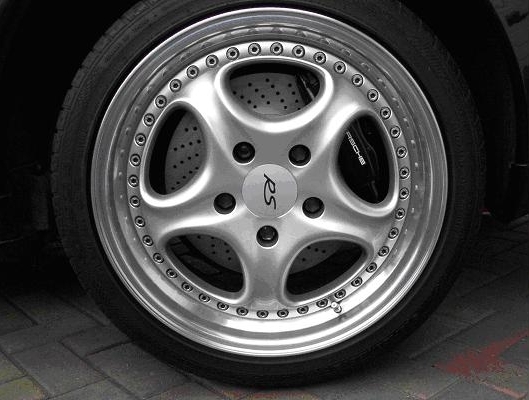 After scouring PET, the closest I could find were 80mm caliper bolts from the 928GTS. I felt this still allowed more than enough bold thread screwed into the hub to be safe. I purchased a set of new TT discs and test fitted the parts. It became clear that the spacer had had to be made larger than extra size of the disc, 11mm rather than the theoretical 9mm (322-304=18mm /2 =9mm) to allow for the arc the caliper cuts across the disc, meaning that the pad sat slightly too far out from the centre causing the wear over the disc edge. 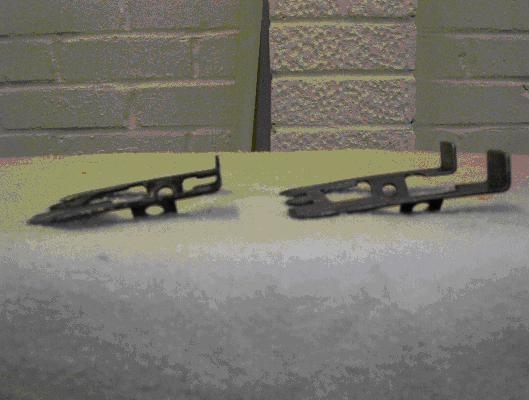 I thought about this and came to the conclusion that the only solution was to change or modify the steel brake pad retaining plates bolted into the aluminium calliper, so that the pad located a little further into the caliper than normal. 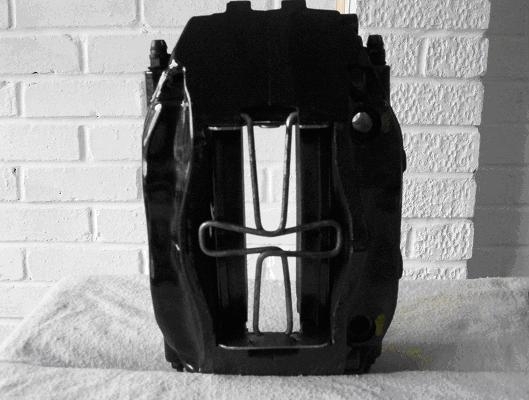 The pad retainers hold the brake pads and allow them to slide into the disc as they wear. I checked my copy of PET and ordered a set of TT/RS �Big Red� pad retainers to determine if they could be modified to fit. See pic of Big Red (left) and S4 (right) pad retainers below. While inspecting and measuring the Big Red pad retainers, it occurred to me that these may enable me to fit the larger (deeper) TT/RS brake pad. I ordered a set of TT pads and again test fitted the parts. 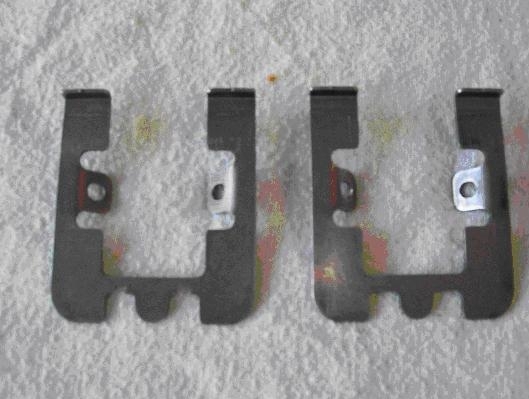 The backing plate of the TT brake pad is very similar is size and shape to the S4 one, but the size and location of the pad material is on the friction side is quite different. 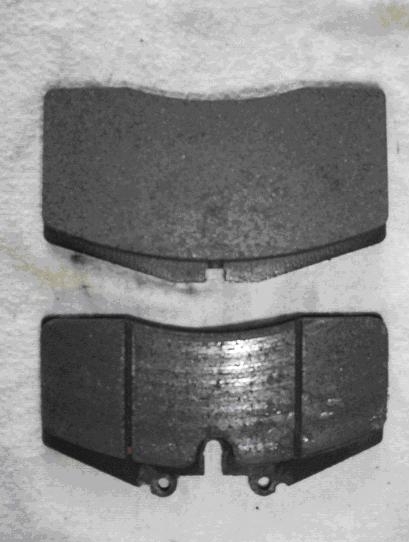 Friction side of TT top and S4 brake pads. The Big Red pad retainer is 10mm longer than the S4 one, but this extra length is obtained by being longer on both sides of the centre fixing point. On the inside (hub side) it gave me about 4mm and on the outside 6mm. 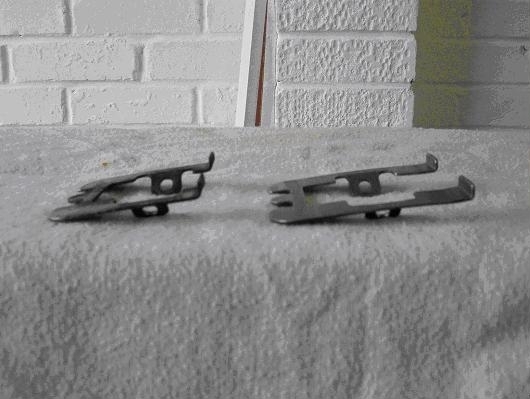 Interestingly the upturned edges of the Big Red retainer were MUCH bigger than the original S4 ones (see pic) and I felt that this extra height could be used to straighten out and re-bend the retaining edge further along, allowing me to locate the TT/RS pad in the S4 caliper. 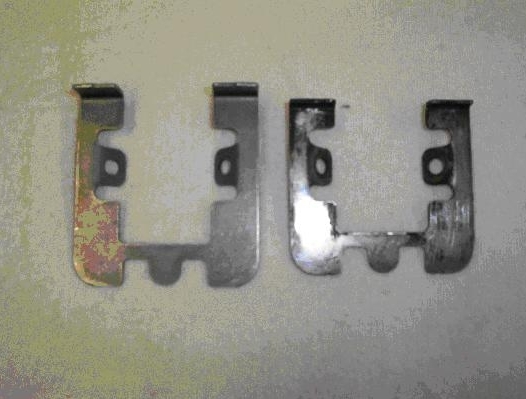 Below, front profile of the S4 (left) and Big Red (right) pad retaining plates. I went to a local machine shop and had the new profile bent into the pad retainer (see pic of modified Big Red pad retainer next to S4 pad retainer. 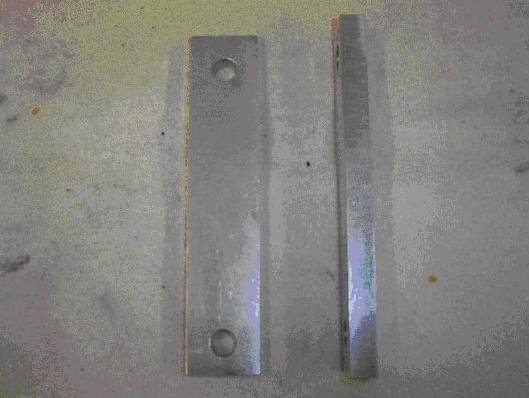 See below, plan profile of the modified Big Red (left) and standard S4 (right) pad retaining plates. 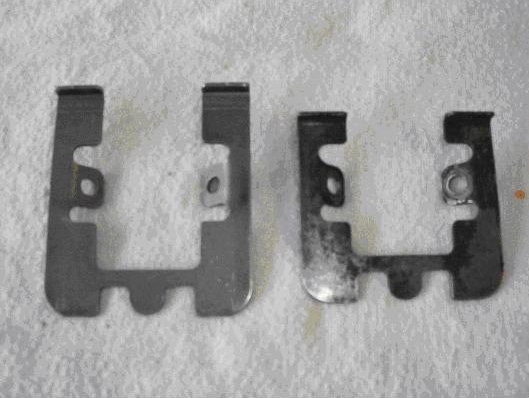 See below side profile of the S4 (left) and modified Big Red (right) pad retaining plates. 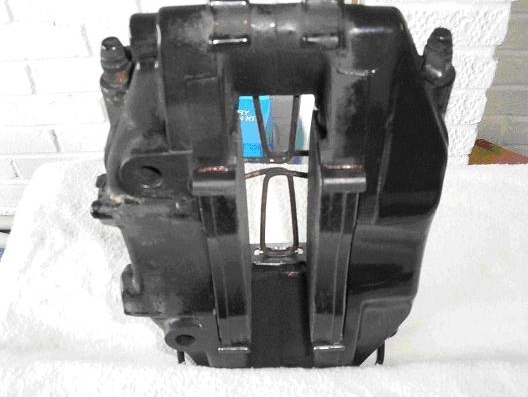 Modified upper pad retainer (below left) with extra slots filed into it to allow pad retainer spring to clear it. Back view of assembled caliper. Note, pads protrude beyond the inside face of the caliper. Side view of assembled caliper (RHS). 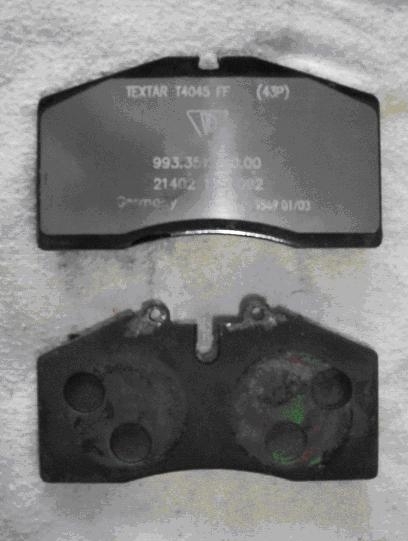 Note, pads protrude beyond the caliper face on the left side of this picture. Front view of assembled calliper. After�. Caliper complete with TT pads assembled onto TT 322mm disc. After�. Wheel re-fitted over 322mm disc and modified S4 caliper. Peter Skelton - For the initial idea. Peter is the boss of Incero car cleaning products and runs a very rapid moderately upgraded 993 Carrera at UK track days. 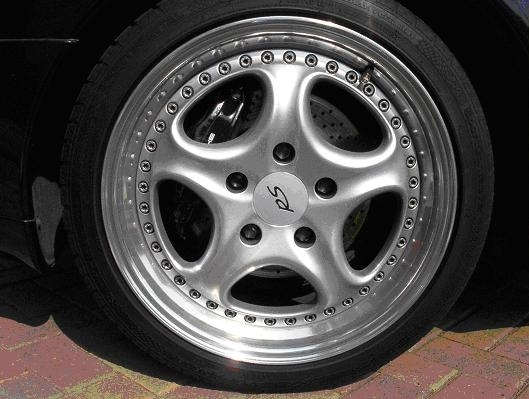 John Mulchay - Supplied the used RS discs and spacers. 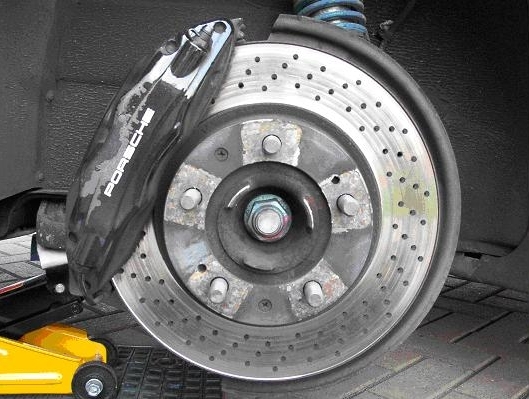 John had these going spare after further upgrading his 993C4 to a full Big Red calliper set-up on the front. The spacers were made for John by G Force Engineering.